Some times in life you have to wait but it seems as though the waiting makes it all worthwhile. This is definitely the feeling for Phoenix Mercury fans who have waited five years to see their team win the WNBA Championship. The waiting is now over with a 87-82 victory over the Chicago Sky resulting in a three game sweep of the Finals. The UIC Pavilion was the place to be on Friday night and there was no surprise that Diana Taurasi was at the centre of everything for the champions. With less than 15 seconds on the clock, Taurasi struck a fadeaway jumper and was then fouled, which was more than enough to put the Mercury into the lead, a lead which they held out. Taurasi was on fire, grabbing 24 points, a feat matched by Candice Dupree, and these two players were hugely influential in bringing the title to Phoenix. Of course, it was deemed that Taurasi was the main star of the show as she was named the MVP in the Finals. This is something that all basketball players dream of and this was actually the second time that Taurasi had claimed such an accolade. 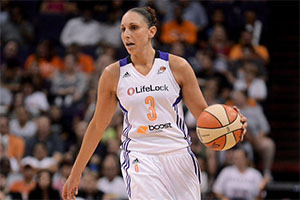 Taurasi had been on fire all season as the Mercury demolished all who stood in their way. It was a record breaking season with the Mercury picking up 29 wins in the regular season. This is a new WNBA record and it is a fair indicator of their strength and power throughout the season. Very few teams could live with Phoenix during the course of the season and this continued into the post season games. The Minnesota Lynx, a bitter rival, were overturned in the final of the Western Conference, which was a particularly sweet moment for the fans and players. That was a win which set up the Championship matches with Chicago Sky and there was only one team looking to win it. It was the first season in the job for Phoenix coach Sandy Brondello and it is one that he will remember for a very long time. This was the third time that the Mercury had clinched the Championship, having now made four appearances in the WNBA Finals. The previous title triumphs for the Mercury came back in 2007 and 2009. The celebrations after this latest triumph are likely to be long and hard after the gap since the last one. MVP Taurasi spoke after the game and said that the players felt that 2009 was going to be one of a series of triumphs but of course, that was to be the last until now. Given that the club had such a strong season, they wanted to make the most of the opportunity and they did so by blasting away their opponents. There has been some dull seasons in the past few years for Mercury fans, with some seasons seeing the team miss out on the playoffs, so this was a chance that the team had to make the most of, which they did. The fact that they did was down to a lot of the talent and skill shown by Taurasi, who can easily claim to be one of the top scorers in the history of the woman’s game. The clinching game was played without Brittney Griner, who was unable to play after undergoing eye surgery to treat an injury she picked up in Game 2. The absence of the player was a blow to the team, with many Chicago fans taking some hope from Brittney’s inability to play but in the end, the Mercury had enough about to win the game and the Championship.